During the summer and fall of 2013, Home for Life had a mysterious visitor to the sanctuary property, a daily visitor who was virtually invisible. Later we would learn the visitor was a "he," and would catch glimpses of him through the tall grass. We figured we had a stray cat who had either been dumped over our fences or gate or who had managed to get on the property on his own. We didn't know what he looked like or where he went during the day. But as dusk approached and evening shadows fell, he would emerge from the tall prairie grasses in back of the cat building and tentatively walk up to the back of the cat building. It became part of our staff's evening routine to leave a bowl of dry cat food, fresh water and a bowl of canned food. As soon as the bowls were set down and staff were walking back in the building, the little visitor would softly walk up to the dishes from his hiding place to eat. He would run back into the tall grasses and the forest behind the buildings if we approached him. But in the morning, the dishes were empty, every morsel eaten. As the weeks went by and our visiting cat became accustomed to his nightly feedings, he began to make his preferences known. Fish flavored canned food was not always finished, and so we learned that kind was not one of his favorites but that any chicken variety of canned food was heartily enjoyed. He preferred Royal Canin dry cat food to Science Diet or even Fancy Feast dry kibble. Our staff became fond of our mysterious visitor, and he became part of the sanctuary even though he was like a spirit who haunted the facility, always present but never seen. We never knew where he went during the rollicking, busy daytime hours, but he always was there in the evenings to get his supper. We tried numerous times to catch him in a live trap but he never once went in. He had obviously been trapped before or saw other cats or animals who had been trapped and was intelligent enough to avoid the same fate. The food we baited the trap with sat untouched. After several days of this stand off, we gave up and resumed feeding him, not wanting to let him go hungry. As the weather turned colder during the fall of 2013, we worried about what we could do for the cat who would not be caught, who was part of Home for Life, yet still not. On a few cold evenings, he didn't show for his evening meal, and the food would freeze overnight in the bowls. After a few nights of this, he would appear and then not again for several days. When he did show up, and we spotted him, he would dash away but not far, and wait for his food to be brought out. Then he would eat it all up and even wait for second helpings- he was that hungry. That year, the fall temperatures were very cold but snow did not come until early December. We hadn't seen the cat for several days after the first snowfall, until suddenly one frosty morning in mid December the staff spotted him, hungry and cold. He was off his scheduled visit time but he was famished, and because of hunger and the cold, not as quick as he normally had been over the previous months. A couple of the staff trapped him using one of the wading pools we have for the dogs in the summer which were now stacked in the back near the cat run- all that was handy to catch him on short notice. He was terribly scared to be caught, but maybe a little relieved too, as he let the staff wrap him in a blanket and carry him to an isolation room indoors. Never a dull moment at Home for Life! We could now get a look at the mysterious stranger who had haunted Home for Life all these months, but his story was still not over. That same day, we took our new cat to the veterinarian for a health check and testing. He needed to be neutered. He had a bit of flea dirt on him, was thin despite our daily feedings and Leukemia positive on the Snap test. But, when we received the IFA testing back (a blood test used to confirm a leukemia diagnosis in cats), we had a problem- maybe a good problem. The cat was only very faintly positive! Marshfield Clinics and our vet recommended segregating the resident for a period of weeks, trying to rebuild his health and condition and then retesting him to determine if he was truly Leukemia positive or, if with good care and less stress on him trying to survive, he could throw off the Leukemia virus. Leukemia is a viral disease of cats that is highly contagious among them. At Home for Life, we confirm the diagnosis of Leukemia in cats by using both the SNAP TEST and the IFA. Both are blood tests,but we have found over the years that the SNAP test will sometimes produce a false positive. A cat should never be put with Leukemia positive cats let alone euthanized based on the SNAP TEST results alone . If a cat is Positive on the SNAP and also on the IFA, then it can be assumed that the cat is indeed positive and will remain so for life. HOWEVER, if the cat is NEGATIVE on the confirmatory IFA test, the cat should be retested in 8-12 weeks to be sure he or she is in fact positive.Over Home for Life's 17 year history we have had 10 cats, including Kris, who initially tested positive on the SNAP but whose result on the IFA was negative. Often these are cats, who like Kris, are run down and very stressed. When tested several weeks later, after restoring the cat's health and condition, the cats have tested NEGATIVE on both the SNAP and the IFA tests. It would have been a tragedy for these cats to lose their lives thru euthanasia because of faulty test results. Of these 10 cats, NOT ONE has ever tested positive on subsequent testing for Leukemia on the SNAP or IFA. It pays to be cautious when making decisions about the fate of cats based on test results. For the next several weeks, the cat, whom we named Kris Kringle, lived in one of our isolation rooms. Although we hated to isolate him, Kris thought the accommodations were great after his many hard months trying to survive: withstanding the rain, cold and then the snow, trying to find water and enough food and trying to avoid the predators, cars and hunters that abound. Kris was virtually a feral cat when first captured by us, terrified of people and unwilling to be handled. He would hide behind the cat tree whenever we came into the room. Each evening when she worked, Executive Director Lisa would take some time and sit on the floor with Kris, so he could have company. The goal was to spend the length of 3-4 holiday music songs with him - about 30 minutes - each evening. It took a while, but gradually, Kris started venturing out- a cat can never overcome their curiosity- they just need time to do so on their own terms. But time we had since it would take many weeks before Kris could get retested. After several weeks, he began to approach for a few pets before running back to his cat tree quickly. Passing by his room during the weeks of his confinement, staff would see Kris sitting in the window on the wide ledges looking out, observing daily activity. As he got used to the routines of each day at Home for Life, and started to feel better and stronger, he became more friendly too. Maybe he had nothing else to do but it seemed he started to look forward to Lisa's visits each evening when she worked. A cat can only scratch his claws on a tree or play with catnip toys for so long. By the time Kris was ready for his follow up IFA testing , he would come out and roll on his back to be pet for all our staff , charming and social. Even if Kris turned out to be Leukemia positive, we would have kept him at Home for Life as we have a cattery devoted to leukemia positive cats. Still we hoped that his test would be negative because it seemed so unfair that he would contract the leukemia virus on top of his many tough months of trying survive. We were elated when the test came back negative! Our veterinarians gave the clearance to spring Kris from isolation. He joined our cats in the North cattery in the spring of 2014. We never seriously thought of sending Kris away to another rescue or shelter. After all he had been through, and after all ;we had been through with him - helping him survive when he was out and on his own, finally catching him, helping him overcome starvation, exposure, Leukemia and restoring his faith in humans after his months or years as a feral cat, he was part of Home for Life. Kris now is a confident and beautiful black fluffy cat. He is the first to greet staff and visitors entering the North cattery, and remembering Lisa's special kindness to him in his early days, always follows her until he receives a special greeting and acknowledgment. Kris has also become the unofficial mentor to several young cats who had lived outside and who, like he, fought the good fight to survive before being rescued by Home for Life. He has taken Ricky, Tom Thumb and the twins Nickatnite and Nighttrain under his wing and seems to show them the ropes of how to navigate the North cattery. He is social and gentle with everyone - cats and people. The cats all seemed to know him anyway as Kris undoubtedly became acquainted with many of them during his many months living outside: they probably all met when he came up to the outdoor cat run to see who was there. After all his time on his own and outside, Kris has no curiosity or wish to be outdoors in our cat runs. He is always in the warm, comfortable catteries with his friends. He is happy to leave his prowling and feral cat days behind him and as symbol of all he has been through, Kris Kringle proudly wears a red collar with a bell because he will always be Home for Life's cat who came for Christmas. 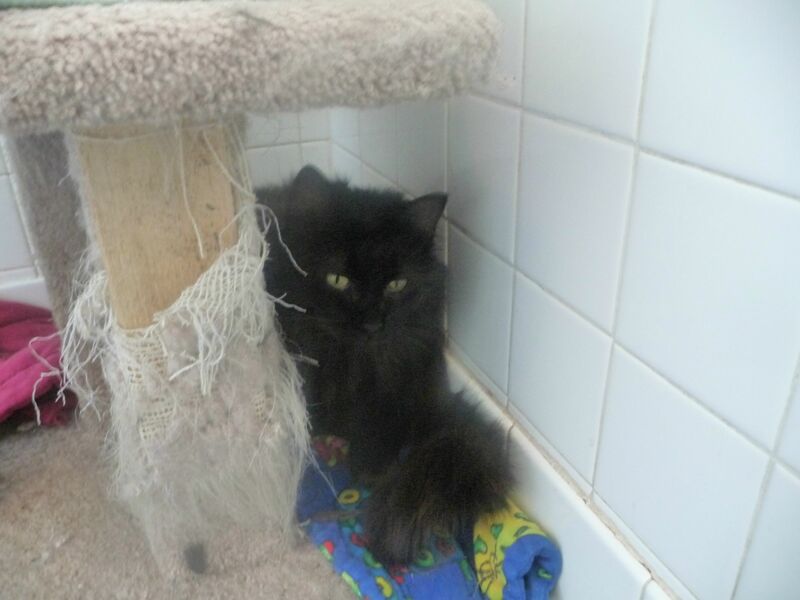 Home for Life has much compassion for feral cats and other cats, who like Kris, have become wary or necessity and would welcome a warm place to live. Our blog post Coming in from the Coldis dedicated to Kris and all our feral and formerly feral cats at Home for Life. If you would like to sponsor Kris, please fill out this form.